TD Ameritrade Essential Portfolios offers automated portfolio management that's in line with services of other robo-advisors. The standouts: A lengthy list of account types and a socially responsible portfolio choice. The Bottom Line: The robo-advisor from TD Ameritrade brings investors a wide range of account options and socially conscious investments at low prices. TD Ameritrade is the behemoth behind one of our top picks for best online brokers. So it’s no surprise that its service for the hands-off set — TD Ameritrade Essential Portfolios — is a competitive player in the ever-expanding world of robo-advisors. Essential Portfolios is the ground-floor offering in TD's lineup of three managed portfolio options, which include Selective Portfolios and Personalized Portfolios. As the name implies, Essential Portfolios focuses on providing just the essentials -- a diversified portfolio built with a minimum number of exchange-traded funds (ETFs). (Just seven ETFs in the core portfolios and eight in the Socially Aware portfolios versus the 10 or more most other services draw from). The service’s $5,000 minimum investment requirement puts it in the middle of the pack among peers, but its 0.30% management fee is competitive. Morningstar-built portfolios: Unlike other online brokers that have launched advisors, TD Ameritrade doesn’t have its own funds, so the funds here are nonproprietary. They were recommended by Morningstar Investment Management, a well-respected investment research and advisory firm. As online brokers have entered the robo-advisory field, some have used their own funds to build portfolios, effectively lining their pockets twice, with fund expenses and management fees. Morningstar’s guidance here can help investors feel confident that the funds used — mainly from iShares and Vanguard — were chosen because they’re a good fit for the portfolios and risk goals. They also happen to have extremely low expense ratios: The weighted average expense ratio on the five core portfolios offered ranges from 0.07% to 0.08%, earning TD Essential Portfolios five stars in our scoring for the cost category. Competitive management fee: This is another key fee for investors to compare. TD Ameritrade Essential Portfolios' 0.30% management fee puts it in line with other robo-advisors launched by online brokers: E-Trade Adaptive Portfolio and Vanguard Personal Advisor Services both charge the same; Fidelity Go's fee is 0.35% and Merrill Edge Guided Investing charges 0.45%. That said, it is higher than the two most popular independent offerings: Betterment and Wealthfront charge a 0.25% management fee for their basic offerings. Account choice: This is the longest list of account types we’ve seen from a robo-advisor, including business accounts, which are rarely managed by robo-advisors. No matter what kind of account you’re looking for, Essential Portfolios probably manages it. Free tax-loss harvesting: Tax-loss harvesting is a popular feature from robo-advisors that attempts to limit the tax impact of taxable accounts by selling losses to offset gains. TD offers it for free to all Essential Portfolio clients. Socially aware portfolio choice: Investors interested in aligning their investment choices with their values will appreciate TD's Socially Aware Portfolios offering as an alternative to the core portfolios. Investments are chosen based on "ESG" principles (ETFs comprised of companies that score high on environmental, social and governance factors). Like the core portfolios, the exact investment mix reflects the client's risk tolerance (conservative, moderate, moderate growth, growth and aggressive). Just be aware the weighted average expense ratios on these portfolios is higher than the core portfolio expenses: 0.11% to 0.18% versus 0.07% to 0.08%. 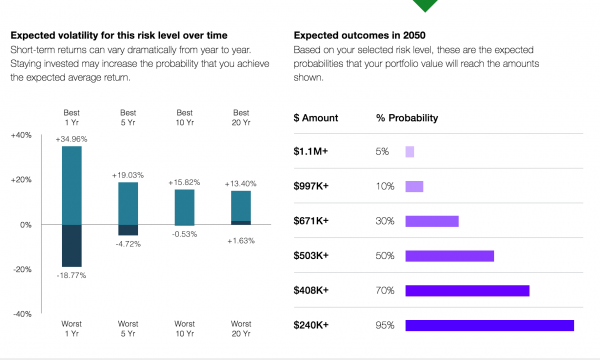 Thoughtful onboarding process: Like other robo-advisors, Essential Portfolios sends clients through an initial questionnaire to gauge risk tolerance, time horizon and investment goals, which are then used to recommend one of five ready-made portfolios. The series of questions attempts to assess the client’s general financial picture, asking how many months' worth of income are available in savings and whether you plan to make withdrawals from the portfolio before reaching your goal. The investor can also toggle through various portfolio choices, viewing the recommendations for various levels of risk tolerance before selecting one. The service then serves up predictions for expected volatility for each portfolio, along with the probability of accumulating various account balances. Small portfolios: These are bare-bones portfolios — that’s where the name of the service draws from, because only the essentials are included — with only seven or eight ETFs per offering; other advisors cover 10 or more asset classes. The funds that are included cover domestic equities, international equities, emerging market equities, domestic fixed income and international fixed income, along with a small allocation to cash. TD Ameritrade says that it believes the portfolio is well-diversified, but clients who want a greater degree of customization and diversification might be better suited to their other digital advisory offering, TD Ameritrade Selective Portfolios, which offers self-guided advice paired with human interaction. That service includes a greater number of asset allocation models constructed of ETFs or mutual funds — also selected by Morningstar — and covers more asset classes. It carries a $25,000 investment minimum and management fees vary by portfolio size. 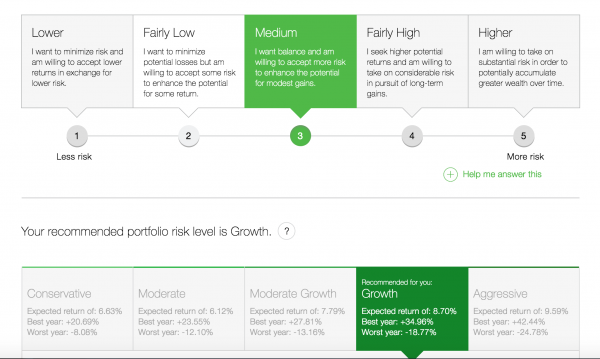 Is Essential Portfolios right for you? The field of robo-advisors has gotten crowded in recent years, to the point where many of these services are beginning to look the same. With Essential Portfolios, the pricing (0.30% management fee), service offerings (free tax-loss harvesting) and portfolios (low investment expense ratios) are comparable to other services on the market. The standout feature — what you won’t find at most other robo-advisors — is the exhaustive list of account types. The socially responsible portfolio option is another head-turner. Overall, Essential Portfolios is an all-around solid option and a natural choice if you’re an existing TD Ameritrade customer looking for a hands-off digital solution.